Honoring your First Promise to your dog and supplementing with Omega Canine Shine® every day, you can easily achieve the healthiest ratio of natural Omega EFAs (Essential Fatty Acids)—higher in 3 & 9, lower in 6—from human food-grade, ground, fortified flaxseed; fish oil; and sorghum; along with synergistic plant and vitamin based antioxidants. Omega Canine Shine® is a great tasting supplement and easy to serve. • Optimal levels of Omega-6 and Omega-3: To promote the proper ratio of Omega-6 to Omega-3, Omega Canine Shine combines Pure Glean Stabilized Ground Fortified Flax Seed with other natural ingredients – stabilized rice bran, ground sorghum seeds, herbs, spices and refined fish oil – to provide the optimal method of achieving the ideal balance of Omega-6 and Omega-3 levels in your pet’s diet. • “Short chain” and “long chain” Omega-3: To speed assimilation, animals need “short chain” LNA as well as “long chain” EPA and DHA. Omega Canine Shine has stabilized ground fortified flax seed to provide “short chain” Omega-3 and refined, medicinal-grade fish oil (not Menhaden) to provide “long chain” Omega-3. • Antioxidants from natural sources: To prevent fats from becoming rancid, thereby preventing damage to your pet’s chromosomes – Omega Canine Shine contains high levels of four different antioxidants: Lignans, Tocotrienols, Polyphenols, Oryzanol and Tocopherols. • Fiber: Soluble and Insoluble: To encourage the growth of beneficial bacteria, animal diets need to include soluble fiber. To encourage proper stool action, animal diets need insoluble fiber. • Magnesium: Hypomagnesium is the most common electrolyte abnormality in critically ill canines, according to Tufts University School of Veterinary Medicine. Oxygen as a molecule is essential for life on earth. Without its presence, animals would not survive for more than a few minutes. Yet oxygen is a double-edged sword; as its existence gives life, so does it slowly take it away, by a process know as “oxidation” — the very process by which all things decay, and “return to dust”. Almost every substance on earth is subject to attack and decay from oxygen.In animals, scientists believe free radicals play an important role in the initiation and promotion of cancer, cataract, arthritis and other degenerative diseases. Exposure to environmental perils, such as chemicals in petfoods, pollution or irradiation, eventually increases the free radicals beyond the ability of the organism’s defense system to cope with it.Free radicals are highly reactive forms of oxygen that damage cells throughout the body. As a dog’s body creates energy at the cellular level, oxygen is metabolized, changing its structure. In this process, the oxygen molecule loses one electron, turning it into a free radical. Free radicals are inherently unstable, since they contain “extra” energy. To reduce their energy load, free radicals react with certain cells in the body, interfering with the cells’ ability to function normally.Free radicals are highly reactive forms of oxygen that damage cells throughout the body. As a dog’s body creates energy at the cellular level, oxygen is metabolized, changing its structure. In this process, the oxygen molecule loses one electron, turning it into a free radical. Free radicals are inherently unstable, since they contain “extra” energy. To reduce their energy load, free radicals react with certain cells in the body, interfering with the cells’ ability to function normally. The natural mechanism which protects us from free radicals weakens with age. Therefore, older dogs, dogs on prescriptions, and very active dogs, are more susceptible to degenerative diseases — including cancer, heart disease, arthritis and cataracts. In today’s high-stress world, our best friends are exposed to many stresses – chemical preservatives in dog food, anxiety, breeding, hunting, showing — creating damaging free radicals at an ever-earlier age.Standing as the major defender against harmful free radicals is glutathione, your dog’s own antioxidant, along with his liver – as the primary detoxifier of harmful chemicals both consumed and produced in the body. This organ’s antioxidant abilities are crucial to life and well-being. An overburdened liver, with insufficient supply of antioxidants, will result in disease and even death.In this day and age, supplementation with antioxidants to fight free radicals and prevent age-related diseases is becoming a necessity rather than a choice. There are many types of antioxidants available. The most common ones are the vitamins C, E, A, and selenium. Research on several important new forms of antioxidants, shows that these antioxidants are many times more potent than the above-named nutrients, and work in different ways for additional protection. Polyphenols are very powerful antioxidants, and act to regenerate Vitamin E after it becomes oxidized. A good source of polyphenol antioxidants is sorghum seed. Per serving, sorghum contains more antioxidizing power than any other food. Omega Canine Shine contains ployphenol sorghum along with 6 other powerful antioxidants! Since numerous forms of free radicals are produced in your dog’s body, it makes sense to supplement with the wide range of antioxidants found in Omega Canine Shine. That way your dog’s body can effectively deal with the different types of oxidative damage from all these radicals. The wide range of antioxidants and powerful nutrients in Omega Canine Shine gives your dog longevity. Omega Fields’ PureGlean Milling process delivers a more potent form of Omega Three Fatty Acids. Painstakingly perfected at a small, state-of-the-art mill in rural Wiscoinsin, the proprietary process ensures a powerful dose of Omega 3s every time you share an Omega Fields’ product with your dog. Let us help keep the promise you made to your dog when they became a part of your life. Feed them an unmatched dose of Omega 3s through Omega Fields’ PureGlean Milling process. Omega Fields….Of One Heart. You can have confidence in the Premium, Human-Grade, Non-GMO, 99.9% Pure, Stabilized, Ground, Fortified Flax we use in our Omega Horseshine® formula. PureGlean stabilization technology provides a stable, ground, fortified flaxseed composition as a rich source of Omega-3 in the diet. Mix with your pet’s regular food daily according to the chart or as directly by your veterinarian. Start gradually first week and then increase to full amount. The stabilized, ground, fortified flaxseed used in Omega Canine Shine® utilizes PureGlean stabilization technology. The powerful nutrients in Omega Canine Shine® are locked in and guaranteed stable for at least 18 months with no signs of rancidity or loss of nutritional value. Best if stored in a cool, dry place. Recent scientific studies show that in most dog foods (even the premium varieties) the dietary ratio of Omega-6 to Omega-3 is 25 to 1. *Nutritionists agree that the ideal dietary ratio of Omega-6 to Omega-3 (to achieve and maintain optimal health) should be in the range of 1 to 1 to 3 to 1. The reason, according to Dr. Artemis Simopoulos, in her book, “The Omega Plan”, is that during the last 100 years the supply of Omega-6 in diets has increased 300%, whereas the supply of Omega-3 in diets has decreased 80%! She’s found that eating a balanced diet, including the right fats, is the key to good health and longevity for animals and humans. Getting enough Omega-3 fats is key, she says. *A 3-to-1 ratio of Omega-6 to Omega-3 is the ideal balance based on scientific studies done by: Dr. William Lands, the leading Omega-6 and Omega-3 researcher in the U.S., NIAAA, Bethesda, Maryland Dr. Michael James, Rheumatology expert, Royal Adelaide Hospital, South Australia, Dr. Joseph Hibbeln, respected Omega-6 and Omega-3 researcher, NIAAA, Rockville, Maryland, Dr. Artemis Simopoulos, Center of Genetics, Nutrition & Health, Washington, D.C., author of “The Omega Plan”. 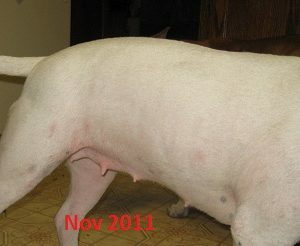 How long will it take to see a difference after I begin feeding Omega Fields products to my dog? Let’s take a very basic look at why Omega Canine Shine and Omega Nuggets (as super rich sources of Omega-3) have such a positive effect on the overall health of your dog’s body. The outer coating, or membrane, of every one of the billions of cells in the dog’s body is unusually rich in Omega-3 fatty acids. In fact, Omega-3 essential fatty acids are the main structural fat that makes up this membrane and play a vital role in how cells function. Omega-3 essential fatty acids are the first fats utilized by the body. Therefore, when the cell’s membrane is healthy it can let in all the good nutrition for the cell, as well as eliminate all the toxins which will be carried out of the cell and removed by the bowels. It is really quite simple –Healthy cells = Healthy body! Since the coat/skin is by far the largest organ on the animal — it will be the first to show the healthy effects with a beautiful shiny, full, richly colored coat and healthy skin. You can usually expect to see results within four weeks. It sometimes happens sooner — but since every dog has a different metabolism – we usually are comfortable suggesting a minimum of one month. Omega-3 is effective as a powerful anti-inflammatory, so if you have dogs with arthritis or hip dysplasia, you should notice them have more free range of movement within a one month period. What's the difference between Omega Canine Shine and Omega Nuggets? How much should I give to my dog every day? Do I need to give them both? While each product’s formulas do differ a bit — each one is enriched with Omega-3 essential fatty acids and antioxidants to help maintain the health and performance of your dog. Omega Canine Shine’s base of stabilized, ground flaxseed is enhanced with a high percentage of fish oil, antioxidants, vitamins, and minerals. It is the best supplement choice to boost a dog’s diet with both short-chain Omega-3, Omega-6, and Omega-9 from the flax and grains, long-chain Omega-3 from the fish oil, high levels of four all-natural antioxidants, and a strong blend of 17 vitamins and minerals (especially rich in magnesium). Omega Canine Shine is easily top dressed over your dog’s food. Because of its high oil content, it sticks quite readily to the dog food bits. The correct ratio of essential fatty acids, synergistic antioxidants, vitamins and minerals in Omega Canine Shine will promote visibly healthier skin and coat. Improved learning and memory capabilities make training easier. Greater agility, keen eyesight, and approachability will boost performance. Additionally, Omega Canine Shine may reduce stress, increase longevity, and boost the immune system — helping to create healthy, happy, hardy dogs. Omega Nuggets are a tasty and nutritious Omega-3 treat/supplement for dogs in all life stages. Omega Nuggets base of stabilized, ground flaxseed is enhanced with a percentage of fish oil, plant-based antioxidants, and cranberry fiber for urinary tract health. 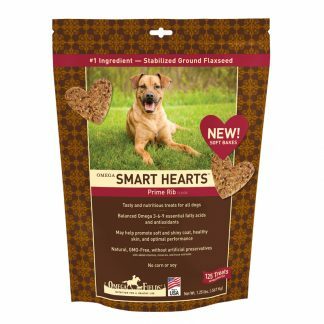 They are the best treat choice to boost a dog’s diet with both short-chain Omega-3, Omega-6, and Omega-9 from the flax and grains, long chain Omega-3 from fish oil, high levels of five all-natural antioxidants, and cranberry fiber. 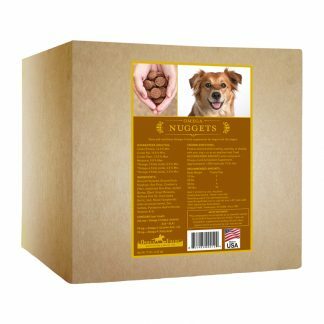 Omega Nuggets are convenient and fun to give your dog — and dogs love them! 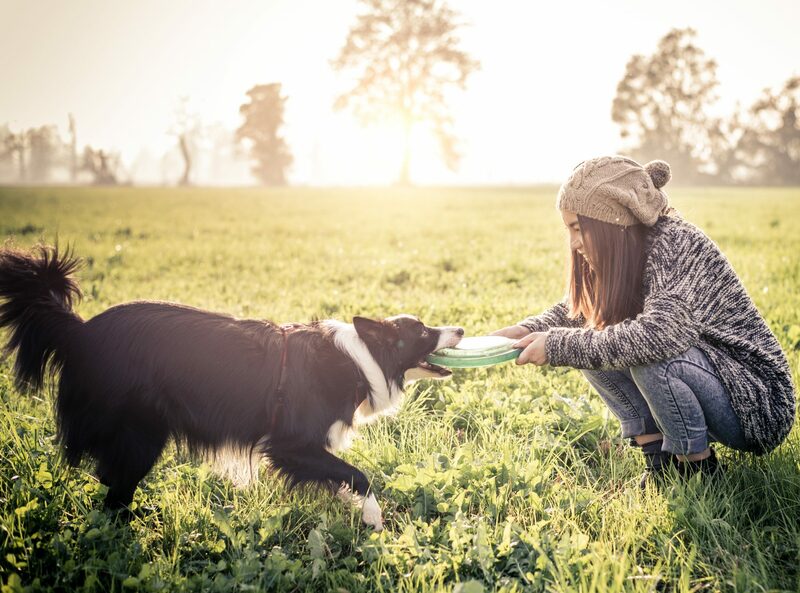 Feed as desired while training, working, or playing with your dog – or as an anytime treat. Feed the RECOMMENDED AMOUNT of 2 treats for every 10 pounds of dog weight when using as an Omega-3/Antioxidant supplement. Omega Nuggets Omega-3-rich dog treats are also a fun and effective way to supplement your dog with Omega-3. The correct ratio of essential fatty acids and synergistic antioxidants in Omega Nuggets will promote visibly healthier skin and coat. Improved learning and memory capabilities make training easier. Greater agility, keen eyesight, and approachability will boost performance. Additionally, Omega Nuggets may reduce stress, increase longevity, boost the immune system, and aid urinary tract health — helping to create healthy, happy, hardy dogs. BOTTOM LINE: Omega Canine Shine is a much more concentrated supplement while Omega Nuggets are a most convenient and enjoyable way our customers have found to “treat” their dogs with the benefits of Omega-3 / fiber. Both products assure that dogs are getting the full spectrum of Omega-3s available for optimum health — from the Omega-3 naturally found in flax seed, and Omega-3 naturally found in fish oil. I am currently giving my dog a broad vitamin supplement. Would I need to continue with that, if I'm supplementing with Omega Canine Shine? How many calories are in Omega Canine Shine? Is there a danger of my dog gaining excess weight with it? Please see calorie listing below along with an explanation of how Omega Canine Shine will not be a source of excess weight gain for dogs. 1 teaspoon serving = 10.175 calories – Recommended for dogs up to 20 lbs. 2 teaspoon serving = 20.35 calories – Recommended for dogs 21 lbs. to 50 lbs. 3 teaspoon serving = 30.525 calories – Recommended for dogs 51 lbs. to 90 lbs. 4 teaspoon serving = 40.7 calories – Recommended for dogs over 90 lbs. 5 teaspoon serving = 50.875 calories – Recommended for dogs over 90 lbs. Omega Canine Shine is the ideal “good fat” supplement because it is heavily tipped in favor of the Omega-3 essential fatty acids your dog’s diet may be missing. Essential fatty acids are the first fats that are used by the body because they are essential to the working of the body — the outer layer of every cell in the body is made up of Omega-3 essential fatty acids. In fact, because the Omega-3 essential fatty acids are utilized so efficiently by the body — they do not normally add excess weight on the dog. Omega Canine Shine is a safe and convenient source of Omega-3 for your dog. I'm wondering if I use Omega Canine Shine do I still need to provide an additional fish oil supplement for the dogs as well? Our bottom line recommendation is that you would not need to continue supplementing with an additional fish oil supplement you are currently giving your dogs, when you are supplementing with Omega Canine Shine. Supplementing your dogs with Omega Canine Shine assures you that they are getting the full spectrum of Omega-3s available for optimum health — from the Omega-3 naturally found in flax seed, and Omega-3 naturally found in fish oil. Our sheltie, Gossip, has lymphoma. Do you know of any reason to not use the Canine Shine with a dog going through chemotherapy? 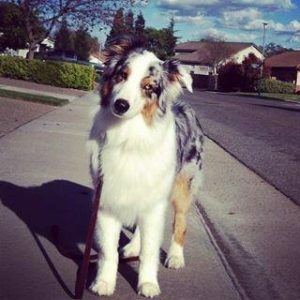 We are sending sincere good wishes for healing/remission for your sheltie! There should be no contra-indications with supplementing with Omega Canine Shine while she is going through chemotherapy. Please see more in-depth information below. Omega Canine Shine is very rich in the cancer-fighting Omega-3 essential fatty acids – ALA, EPA, and DHA – which have a powerful cancer-protective effect, with the potential capability of retarding tumor growth. The formula is based on stabilized ground flax seeds, enhanced with a high percentage of fish oil, both plant-based and vitamin-based antioxidants, and minerals. The correct ratio of essential fatty acids and synergistic antioxidants in Omega Canine Shine will boost your dog’s immune system to better cope with the problems of cancer. Flaxseeds are not only high in Omega-3 essential fatty acids, they are also high in plant lignans — particularly SDG — that are believed to play a role in fighting a broad range of cancer types. The plant lignans present in ground flax (43 mg per tablespoon) are fiber-like phytochemicals that are transformed into “animal” lignan in the colon by bacteria. Lignans are naturally found in foods high in dietary fiber, and are structurally similar to estrogens. Like natural estrogens, they can bind to estrogen receptors, but without causing abnormal changes. Plant lignans have been shown to help inhibit abnormal cell growth and help the immune system do its job. Flaxseed is the most abundant source of plant lignans. Stabilized ground flaxseed is one of the safest ways to get cancer-fighting Omega-3 and lignans into the body. Please keep in mind that these are only our feeding suggestions or recommendations. We believe it is always advisable to check with your canine nutritionist or veterinarian concerning dietary changes you are considering for your dog. What do I do with the Omega Canine shine "powder"? How do I feed it to my dog? Omega Canine Shine is in a powder form that is very palatable and can very conveniently be sprinkled directly over your dog’s natural food. In fact, in taste tests completed at Ontario Nutri Labs — 4 out of 5 dogs actually preferred their food sprinkled with Omega Canine Shine over food without it! I would like to order Omega Canine Shine based on a recommendation from another lab owner who claims your product will help my dogs stop scratching. True or false? Good for you that you take such an active role to make sure your two beautiful Labrador Retrievers, with itching/scratching issues, are getting the best care possible. I believe you’ve been directed to the right place to get blessed relief and comfort for your canine companions. Omega Canine Shine is very much recommended for dogs experiencing the intense allergic inflammatory reaction of itching. The membrane, or outer coating, of every one of the billions of cells in the dog’s body is unusually rich in Omega-3 fatty acids. In fact Omega-3 essential fatty acids are the structural fat that makes up this membrane and play a vital role in how cells function. 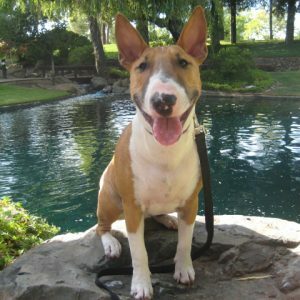 To understand how Omega Canine Shine (as a rich source of stabilized Omega-3 essential fatty acids) helps improve a dog’s quality of life, let’s take a look at how cells behave when they are aging and/or damaged by trauma such as skin conditions, allergic reactions, injury, surgery, or disease. When a cell is irritated or damaged, or when it begins to age, its membranes break down. As a result, compounds contained within the cell walls are released into the cell matrix. Some of these substances, such as histamine, give rise to inflammation and associated pain. Inflammation is a dog’s natural response to skin conditions, allergic reactions, injury, surgery, or disease. Inflammation is characterized by one or more of the following symptoms: redness, intense itching, swelling, heat and moderate to severe discomfort. When skin becomes inflamed, your dog may experience any or all of these symptoms. 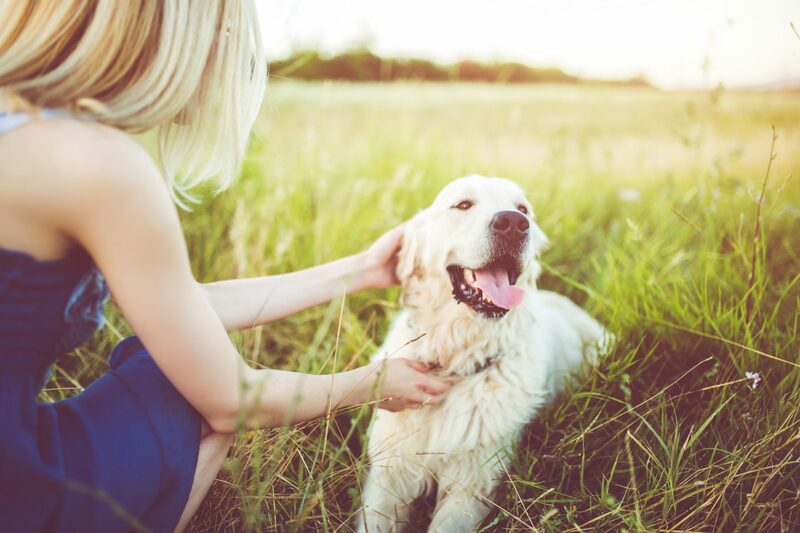 With skin inflammation, there will be extreme scratching and itching taking place that will cause the hair to be rubbed off and sore, broken skin — as you have experienced with your dog. Researchers have found that “inflammation” in dogs has similar underlying factors: a decrease in cell stability leading to membrane damage and subsequent release of compounds that promote damage, spasm and inflammation. Bottom-line: The powerful Omega-3 essential fatty acids in Omega Canine Shine work by stabilizing the membranes of the cells, promoting healing of existing cellular damage and helping to prevent further damage. On a practical level, this means quality of life is improved, and you will see your dog experiencing freedom from scratching and itching. Please keep in mind that these are only our feeding suggestions or recommendations. We believe it is always advisable to check with your canine nutritionist or veterinarian concerning dietary changes you are considering for your dogs. How does Omega Canine Shine eliminate hot spots? Here is a brief history on hot spots — I will try to make this a short answer. Hot spots are surface skin infections caused when populations of normal skin bacteria grow and overwhelm normal resistance. They are generally circular patches that lose hair, can be swollen, may exude smelly pus, and can be painfully itchy, causing the dog to scratch, lick, or bite to the point of self-mutilation. * Flax works from the inside out, at the cellular level- each cell has a phospholipids layer /shell composed of Fatty Acids. * Flax helps with skin and coat health — shedding out less – stabilizes the integrity of the hair follicle. When dogs lack or are deficient in EFA’s ( Omega-3, Omega-6–need correct ratio) side effects are poor skin and coat health and allergies. By supplementing with Omega-3 rich Flax – they will benefit with healthy hair coat – hence they will not have matted, trapped hair. *Omega-3’s are anti- inflammatory and anti-histamine — they stop histamine reactions. Think of inflammation as bad guys – prostaglandin 2’s ( there are good prostaglandin’s as well- but I won’t get into that right now) but think of the bad ones — they cause histamine reactions and inflammation at the cellular level. People tend to default to cortisone ( steroid) to mask systems i.e. : Hot spots instead of supplementing with Omega-3 rich flax to work from the inside out. * Hot spots are a symptom of EFA deficiency. Also note that if you have your dog on a rich high Omega-6 diet, the ratio is inverted and hence causes inflammation- causing allergies and negative reactions. * Also Omega Fields’ canine products are rich in natural tocopherals (antioxidants) helping the immune system. A dog is more prone to inflammation and allergies with a low immune system. Omega 3’s promote healing, promote healthy skin and coat, and prevent re-occurrence of skin allergies and hot spots. Can Omega Canine Shine safely be fed to pregnant and lactating dogs? Omega Canine Shine is recommended for pregnant dogs: It is safe to supplement pregnant dogs with the stabilized ground flax seed and fish oil found in Omega Canine Shine. Pregnancy is one of the conditions associated with Omega-3 essential fatty acid deficiency. During pregnancy the dog’s body becomes deficient in Omega-3 because the fast-growing brain, eye, and organs of her puppies utilize all available Omega-3. Omega-3 essential fatty acids are necessary for normal growth and development and cannot be manufactured in the body. Sufficient amounts of Omega-3 must be added to the pregnant dog’s diet. During pregnancy and lactation the recommended daily serving size for the mother should be increased by two or three times. After the puppies are born and eating solid food, they should get Omega-3 also — adjust the amount of Omega Canine Shine according to the weight. They only need a little sprinkle. Tremendous Change In Their Coats and Overall Well Being! just now by Rayna P.
I have been using Omega Horseshine and Omega Nibblers for years. I think both products are outstanding. 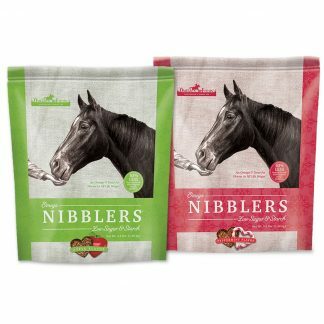 My mare loves the Nibblers and I like the fact that I can break them up into smaller pieces and put them in my pocket for an always accessible treat. They have done wonders for Pearl’s feet and coat. She is grey and even in the middle of winter, with a huge fluffy coat, dirt, and mud ground into her fur, the sun just glints off of her. It is truly amazing. I would also really recommend Canine Shine. I started giving it to my dogs after having such a good experience with the Horseshine. People (my vet included) always comment about how shiny and healthy they look. I gave a bag to a friend who’s dog was itchy and had a dull coat. After one bag he looks like a different dog, all silky and shiny and no more itching. Keep up the good work with your products! Bird Hunter Uses Omega Canine Shine! I have been using Canine Shine & Omega Nuggets for the last 3 months; I am an avid upland bird hunter and have noticed a significant difference in my dog “Barley’s” coat. His coat looks shiny, healthy, and his shedding has been greatly reduced. I also noticed that there haven’t been any wood ticks on him this hunting season. Your products are amazing and I plan to continue to use them for years to come. I adopted a 5yr old Australian Shepherd from the pound in May. When I got him, he was very matted and extremely tick infested. The vet had to shave him practically bald to get rid of both problems. I have my horses on Omega Horseshine and love it, so I thought I’d try Canine Shine on Cooper. With his ticks and mats removed, he was left with dry, itchy, scabby skin. I started him on the supplement a couple weeks after I adopted him, and he’s been on it a week now. The short hair that’s begun to grow back in on his body is coming in silky soft, and the longer hair that was left on his head and feet is now gleaming in the light, and he’s no longer itchy. The only thing I’ve had a bit of a problem with is that Cooper doesn’t necessarily enjoy eating it. He’s not a big fan of dog food to begin with (people food apparently is much more appealing), and will not clean up the powder that does not stick to the kibbles. I think this is just Cooper being Cooper, though, since my mom’s dog is more than eager to come in and lick the bowl clean if given the chance. This product is worth every penny, as is Omega Horseshine. I plan on being a lifetime customer. Our farmhouse dog Pete Townshend is known for eating anything in his path. His habits of eating blueberries fresh from the garden and begging adoringly for popcorn, oatmeal, and carrots are well-known. So, I wasn’t at all concerned when Omega Fields asked if he would like to try their Omega Canine Shine as a supplement to his daily diet. I knew that he would happily enjoy this new addition to his meals. Now that he has been enjoying this healthy supplement for a few months, he has developed a new habit. This one has nothing to do with him actually ingesting food. Instead, it has to do with him anticipating its arrival. Every mealtime, he waits with great anticipation as I place his food in the bowl. Then, as I reach for the bag of Omega Canine Shine, he follows my every movement. As soon as I touch the package, he registers his approval in a very canine manner. He begins licking his lips as if he is about to dine on a T-bone steak. The first morning he reacted in this way, I thought it was mere coincidence. Now that I have seen him repeat it at every meal for weeks, I know that it is much deeper than that. Instead, he is truly giving me his nod of approval. I am happy to see that he looks forward to the Canine Omega Shine that I add to his morning and evening meals. I am even happier to know that I am increasing his intake of essential fatty acids and giving him something delicious to look forward to. While he may not realize it, those essential fatty acids help to reduce shedding, combat bothersome itching, and maintain his good health. Pete and I have enjoyed our time evaluating Omega Canine Shine. His coat is shiny and healthy and he comes running at mealtime. Now we both want to make sure that you have the same opportunity to share this supplement with your best friend. Thanks to Omega Fields, you can do just that. When I first started giving my Cavalier King Charles Spaniels the Omega Canine Shine, one of them couldn’t eat it fast enough. It was as if it was Catnip for dogs! It has been less than a month since I started adding it to their food and already their coats are softer and shinier. WE ALL LOVE YOUR PRODUCTS! I currently use Mega Omega, feed Canine Shine to my dogs, and Horseshine to my horses — we all love your products!! The dogs and horses have lovely shiny coats and my fingernails are stronger than ever before, so I can feel confident that we are all healthier inside as well. My dogs stopped itching and have glorious shines. I love your products! I will ALWAYS continue to use your products for as long as I have animals! 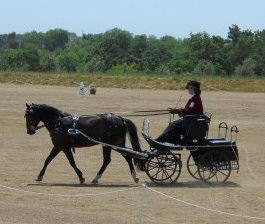 just now by Christine C.
I’ve been using your Omega-3 products for myself, my dog, and my horse. The dog was the first to enjoy your product. It helped his allergies tremendously. After years of agony, within 4-6 weeks of starting CanineShine he had stopped the paw licking and his feet were completely healed. Thanks so much for your excellent products! After writing the article about nutrition for the October (Omega Fields) newsletter, I started adding Canine Shine to my cat Gingersnap’s food. Although she was already eating top quality grain-free canned cat food, within a couple of weeks I noticed that her coat was much softer and silkier and her overall health appeared better. She was also shedding less. 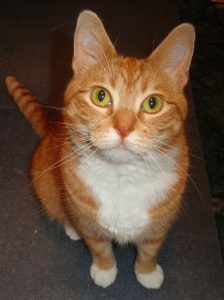 Even my cat is benefiting from a little sprinkle of Canine Shine on her food every morning! 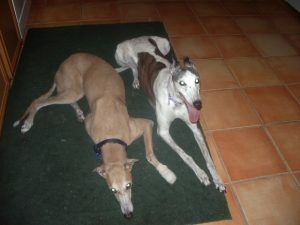 My two greyhounds and german shepherd love Canine Shine! just now by Sandy S.
I had a friend at the barn who was a veterinarian who worked in research for Purina. She recommended the Horseshine after doing extensive research on supplements. My 3 year old Holsteiner was completely bleached out. Within 6 weeks, his coat was dark, shiny and dappled!! I now breed and show Doberman Pinschers. Your product is fantastic! I don’t have to use spray on shine products, because they are so SHINY naturally from the Canine Shine! Love this product! After a friend highly recommended Canine Shine we ordered two lbs. We are almost through 1 lb using it on our pups, I can’t wait to see results in my pups. Great For Coat, Recovery, And Mothers! Logan’s coat is outstanding with this product. When I have been at dog functions I have recommended the Omega Fields Canine Shine to those that ask what I use on his coat. At least every show that we have been at, I have had one or two people ask what I use on his coat. I think because he is darker, the omega comes through on his lighter reds and it just pops his richer tones in his coat. The thickness of his coat is also a major selling point to those in the “showing” world. He definitely carries a thicker coat on Omega Canine Shine. I also promote the quick recovery time with Omega Canine Shine. He can run and run and run and he does not tire out. I have told some breeders about Omega Canine Shine in getting the mothers coat back to where it was before they had their litter. Thank you so much for being such a wonderful company and taking such great care in the world of animals and humans. Amazed by the Difference it Makes! Omega Fields® has an awesome product called Omega Canine Shine™. We are truly amazed at how fast this product started enhancing our dogs over all coat appearance and energy levels. We started feeding Omega Canine Shine™ to our dogs and within 5-8 days their coats are soft, shiny, and we have seen less shedding in the house. What is even better, is our 8 year old dog is back to wanting to play ball with our 3 1/2 year old dog, Logan. The energy that has come back in our older dog is amazing, she is going after balls like when she was a youngster. Our dogs love the taste of Omega Canine Shine™, as soon as we open the pouch to feed them, they run circles and can’t wait to be fed. 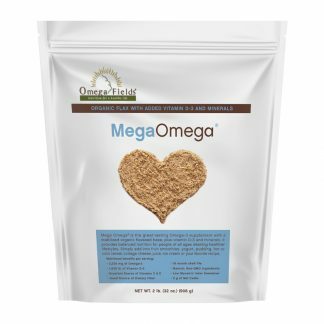 Thank you Omega Fields® for providing canine lovers with such a wonderful product. Logan is proud to be an official Omega Fields® ambassador. We rescued Emma, our Blue Heeler/Border Collie puppy, when she was four months old. She had a very dry coat and was constantly itching when she arrived at our house. After feeding her Omega Canine Shine daily, she no longer itches and has a beautiful, healthy black coat. 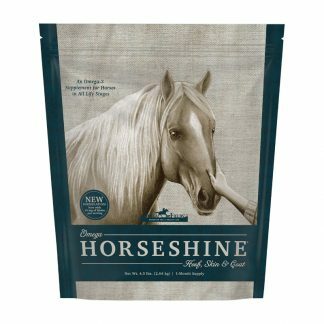 We have used this product for horses and now have used the canine shine. We have a 10 year old jack Russell that was getting stiff and other joint meds made her feel bad. We tried the canine shine and now she is getting around very good and feels great. I would recommend this product. Best Dark Chocolate Coat in Town! 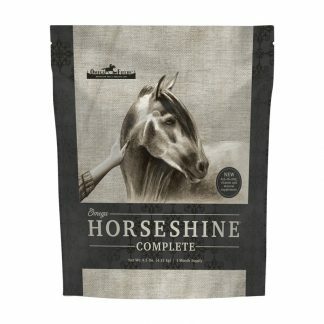 Since discovering Omega Fields Horseshine on our barefoot list and being thrilled with the results on my horses, I started using Canine Shine for my chocolate lab. She has always had an extraordinary dark chocolate coat and she has been on Canine Shine since she was a puppy. We ran out a year or so ago and in the bustle forgot to buy more. After several months we noticed that Moxie looked like the “other” chocolate labs we knew, faded and sunburned looking even though she gets premium dog food. We remembered our Canine Shine, ordered more and within a week or so her former luster returned. Now we tell everyone about our “secret” to the best dark chocolate coat in town. Omega Fields® has an awesome product called Omega Canine Shine™. We are truly amazed at how fast this product started enhancing our dogs’ overall coat appearance and energy levels. We started feeding Omega Canine Shine™ to our dogs and within 5-8 days their coats are soft, shiny, and we have seen less shedding in the house. What is even better is our 8 year old dog is back to wanting to play ball with our 3 1/2 year old dog, Logan. The energy that has come back in our older dog is amazing. She is going after balls like when she was a youngster. Our dogs love the taste of Omega Canine Shine™—as soon as we open the pouch to feed them, they run circles and can’t wait to be fed. Thank you Omega Fields® for providing canine lovers with such a wonderful product. Logan is proud to be an official Omega Fields® ambassador. I have been feeding my dog Omega Canine Shine for the past couple weeks and I’ve noticed a decrease in her shedding and her coat feels much softer! Coats So Shiny – Black Color Looks Almost Blue! 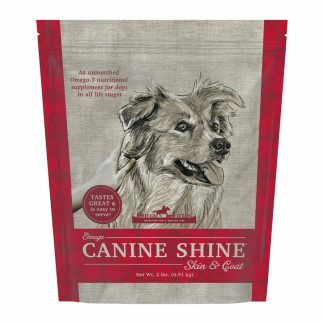 I just sprinkle the recommended dose of Omega Canine Shine on Ruger & Mitzy’s (my Boston Terriers) food every morning and they think they are getting a special treat. They love it! The extreme temperatures of our northern winter season keep them indoors. Normally, their coats are usually quite flaky and dry by mid-December. But, as you can see from this photo (taken after only 8 weeks of Omega Canine Shine), their coats are so shiny – the color of black looks almost blue! Not only does the Omega-3 keep their coat shiny it has also dramatically reduced the tear stains under their eyes. Also, they both have more “zip”! Thanks for making fantastic products! I started giving my Australian Shepherd Omega Canine Shine a couple months ago just to see what would happen, and he’s never looked better ! Now I feed the supplement to my English Bulldog and Omega Horseshine to my Welsh Pony. Thanks for making fantastic products! I love Omega Canine Shine. My two labs, Sherlock and Watson, have been on it for one month now and they are both itching less from allergies that they have! Their coats look very shiny and beautiful. I want to keep them on this! Both of my dogs, Fiona and Bella, love the taste of Omega Canine Shine. Both will lick their bowl’s clean until all of the Omega Canine Shine® is gone. Their coats are much softer and shinier. I know that Omega Canine Shine will help Bella’s skin issues due to her auto immune disease. I have already seen an improvement with her irritated tail, which is a problem area caused by her immune disease. Shiny, Well-Toned, Full of Energy, & Incredibly Blessed! Jack was rescued from a high kill shelter in Alabama at about 8 months old. 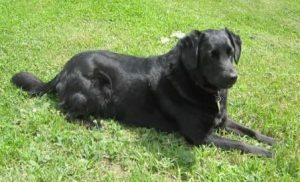 He then spent nearly a year in a foster shelter, because he’s a black dog and black dogs are often considered “unadoptable” in the south. In January of 2012, my husband found Jack on line at www.petfinder.com which led us to Crossing Paths dog rescue ( www.xpar.org ) and the rest is history! We adopted Jack in February of 2012 and arranged his transportation from Alabama as far as New Hampshire by a wonderful animal transport www.rescueriderstransport.net which is a part of www.peaceandpaws.com . We met the transport truck in New Hampshire and fell in love immediately! In just a few hours Jack was at his new forever home in Maine. From lack of exercise and not the best diet, he was a little flabby; his coat was dull and lackluster, he drooled an awful lot, and his breath was really stinky. He was, though, without a doubt, a friendly, sweet, gentle pooch who just loved our cat and us! We changed his diet to a grain free dog chow and added Omega Fields Canine Shine along with Omega Fields Nuggets. Jack loves the nuggets so much I think he would do just about anything to get one! Just after he arrived, we took him for his first visit to the vet. He was weighed, and given a clean bill of health, although the vet noticed his smelly breath and out of tone muscles. A few months ago, Jack went for his annual check-up and the vet was really impressed! His muscle tone was so much better, his breath was no longer foul, yet he weighed exactly the same as his last appointment. Today, Jack is shiny, well-toned, full of energy, and an incredible blessing to us! He loves to ride in the truck and just completed a trip to Minnesota with us! In September he’ll join us in a long trip to British Columbia. I attribute his continued good health and appearance to Omega Fields Canine products!